Pac-12 Enterprises, LLC is the diversified and integrated content and media parent company of the Pac-12 Conference — a firm made up of 12 prestigious western universities dedicated to connecting fans with their favorite college sports teams. In 2012, they embarked on an ambitious agenda — to create the Pac-12 Network, from the ground-up. 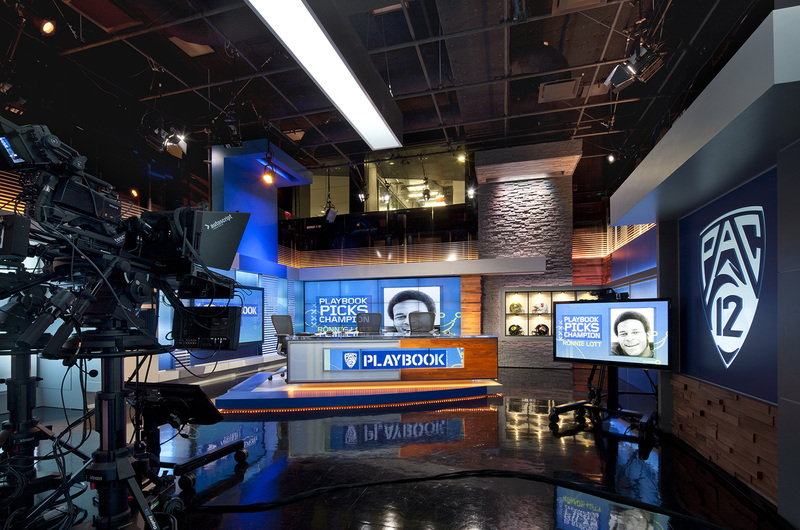 Like the universities these Division I college teams represent, this new 24/7 digital media and TV broadcast network wanted to be seen as innovative, tech savvy and sports driven. 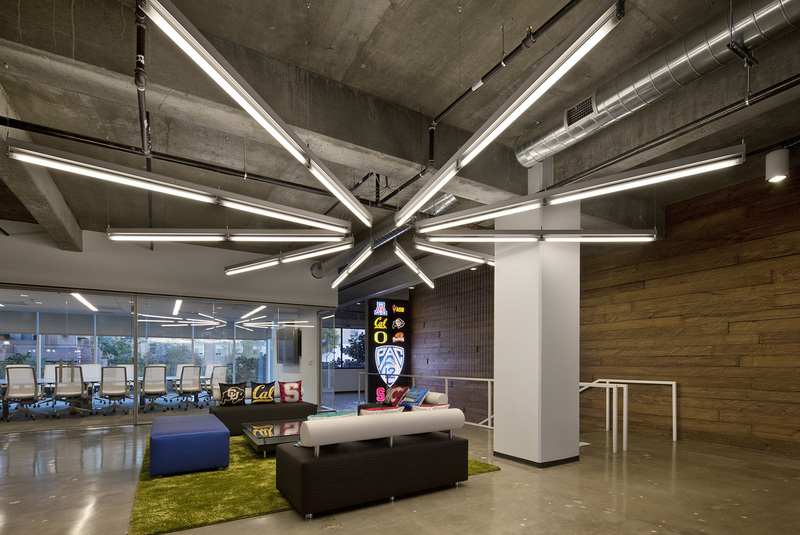 Its new headquarters facility had to be the physical embodiment of this brand. Pac-12 Network office found a location in San Francisco’s South of Market District. 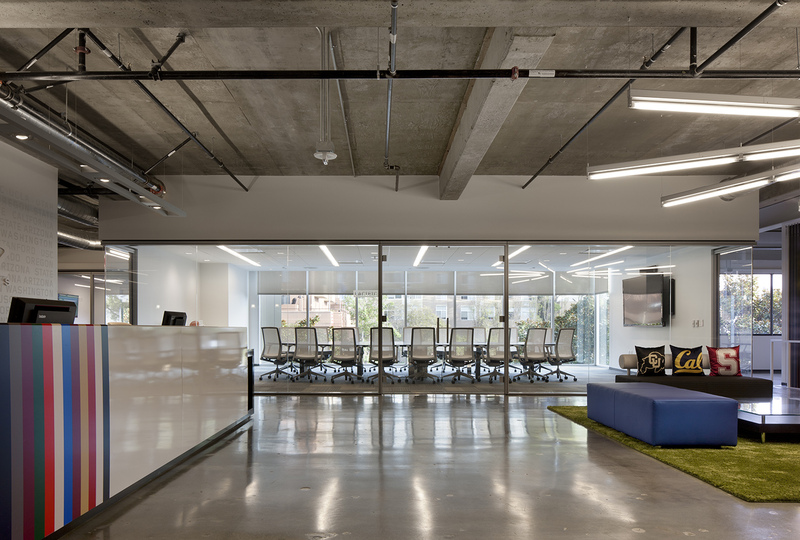 They worked with Unisource Solutions to transform the new space into a flexible, modern office that optimizes square footage and conveys Pac-12’s unique culture. Designed by HLW International, the 75,000 sq. ft. space encompasses two floors and the roof of a 7-story office building. The project included digital media and studio spaces, pre- and post-production studios, 30 private offices and 90 workspaces, 10 conference rooms, a lobby and an officiating command center. After studying Pac-12’s workflow and management style, our team focused on the drive behind the company — the 12 universities they represent. In order to pay homage to the members, we integrated their colors into work areas and included color banding on the lobby desk. 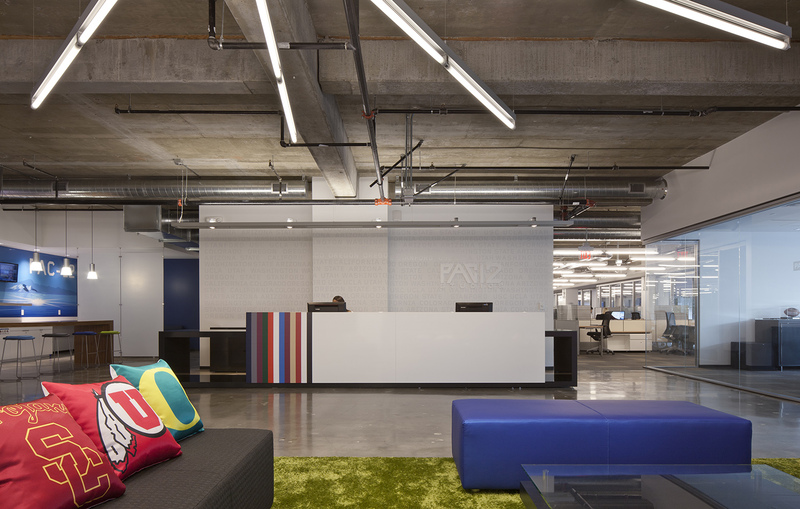 We specified modern workstations and furnishings that represent elements of the company brand. To maximize budget, we specified modular floor-to-ceiling wall systems that were ready to tilt into place. This allowed us to enclose private areas and create spatial nooks with ease and gave Pac-12 greater flexibility to adapt to future needs. The main conference room features a custom designed 20 foot table. Visible through a glass wall which can also project sports statistics, this visually stunning centerpiece was crane lifted via the exterior windows and set into place. For the Pac-12 Network office’s new command center, a state-of-the-art officiating room where officials monitor plays and review reps calls, we custom designed movable tables and mounted two oversized monitors using their specified technology. 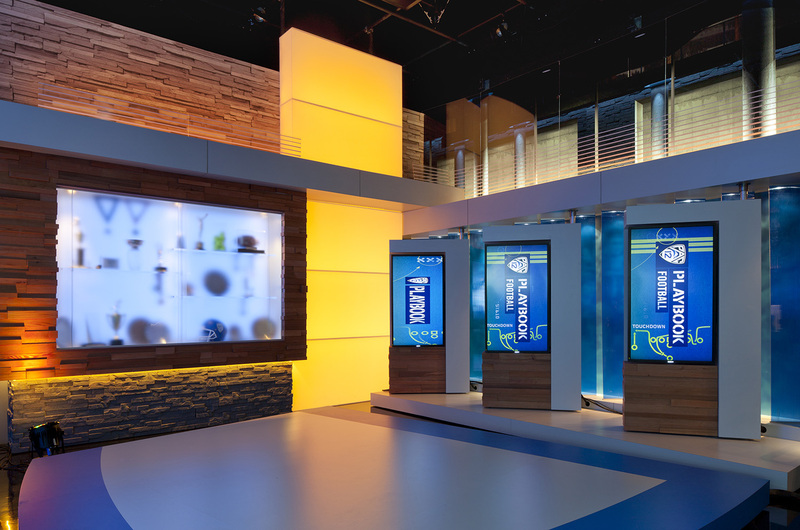 We energized their production studios and worked with trades on lighting, sound proofing and integrating technology. 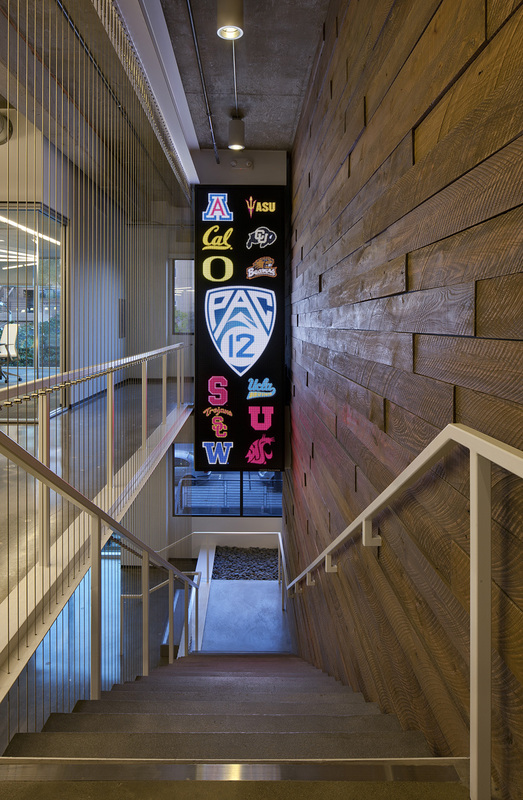 Unisource Solutions has been a partner with Pac-12 since its headquarters’ beginnings and played an integral role in their expansion space. Today, we continue to optimize their workspace solutions, helping them adapt with their growing workforce and ever-changing needs. With a comprehensive approach to office management, Unisource Solutions offers custom solutions for tracking, storage, and design options you need for better workflow and office space.